Summary: is recorded music an asset? Can you break even on a single, and even see some money back on all of the effort you put in to it? How much does it actually cost to produce a single, and what’s the return on investment? The recent release of “Fragments” started me thinking about the true costs of a single release and the potential return on investment. Many of us independent musicians have decried the lack of income from streaming sites, declining digital sales, and the competitive me-too market we now find ourselves in. Exploitation is a real thing, and I would never minimize the impact it has had – and continues to have – on artists. But I also like to consider the potential upsides of releasing music, so in this post, I’m going to explore whether or not creating music can truly be looked at as an investment. What Does It Cost to Record & Release a Single? The cost of recording varies from artist to artist, and is a huge variable. If you have a home studio and the ability to mix and master your own recording, you can keep expenses to a minimum. 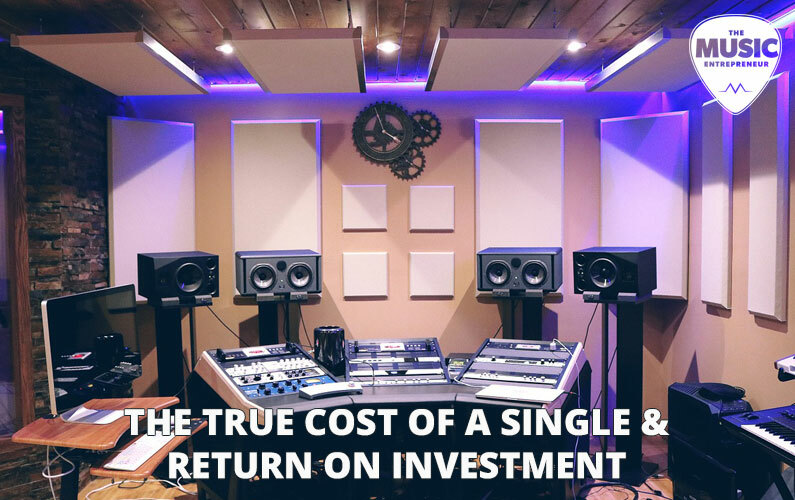 But if you want to work with an experienced producer, record at a top-notch studio, and send your mix off to a separate mastering engineer, you can expect your bill to be considerably more. First, I’m going to take a look at what it cost me to release my single, and then we’ll consider a hypothetical scenario where the costs are a bit higher. The total cost does not include the resources spent on marketing. The costs would continue to mount with each hour spent on promoting the new music. Again, this breakdown does not include the cost of marketing. I’m able to record from home on my own dime. This means cost savings. I’m also able to self-produce, mix, and master my own tracks. The industry doesn’t necessarily like this, so I’m definitely not bragging. But again, as result, I’m able to keep expenses low. Regardless, the $720 difference between the two scenarios could be a bigger spread. And there’s no denying that you will likely get a better quality recording if you work with professionals. Spending more money on your recording could prolong your journey towards the break-even point (though I’m definitely not saying you should spend less on producing your singles). The disparity in quality between the two recordings might be noticeable, but if I were to put the quality of my recording at “pretty good”, and the costlier professional example at “excellent”, we’re really in the same ballpark. If the singles are equal in every other regard, then it mostly comes down to marketing, which we haven’t accounted for here. But you can see how the costs of marketing could quickly add up (even if it’s just sweat equity you’re putting in), making it even more difficult to recoup your original costs. Assuming the true cost of my single was indeed $374, that means I would need to make $374 to break even, and above and beyond that to make a profit. I don’t necessarily have a huge buying audience, but assuming I’m able to grow a fan base over time and continue to drive sales, even modest projections show that I’ll more than make my money back on the release. Now this example might seem a tad depressing, but keep in mind it doesn’t account for any income from streaming, royalties, and other sources. In other words, this is starting to look like a pretty solid investment over the long term, especially when you consider that it isn’t impossible or unrealistic for most artists to release a single every single month. Unfortunately, with the other scenario I laid out, if you saw the same number of sales, you would never break even let alone make your money back. But please keep in mind this is not a post about reducing the cost of recording. It’s about determining whether or not music is an investment with a definite return. If you spent $1,094 on your single, it’s just a matter of selling more than the guy that made 40 sales per year, and that’s not exactly a high bar (keeping in mind that your marketing costs could also be more). From a logical standpoint, I think a single can totally become an asset over the long haul, and it doesn’t necessarily have to take 30 years to pay off. Unfortunately, the purchase of music is largely emotional. Buying anything, in general, isn’t a logical process like we tend to think it is, but it appears to be even less so when it comes to music. You can’t necessarily predict that you’ll have 40 sales this year, and that you’ll be able to continue to drive 40 sales per year for 30 years. You’ll likely see some obvious sales spikes around the actual release of the single, during seasonal promotions, if and when it gets featured in a popular TV show or video game, and so on. But this is how I tend to think, so I thought I would share my crazy thoughts with you.